On a cold winter day, Guillaume, a broken-hearted lover, attempts to regain his honour on a frozen bay. In the middle of the Winter, on the frozen Saguenay river in Quebec, Canada, Guillaume goes back to old traditions to try to get his honor back. Destrier, by director Philippe David Gagné, playfully uses an anachronism to create a short film that is entertaining with its lighthearted tone and visually gorgeous through its unique location. Part of a local project with three other directors living in the Saguenay region of Quebec, writer/director Gagné was tasked with creating a short film about the river and its fjord, the only navigable one in North America. A small budget lead Gagné to focus on coming up with a simple concept for his short, but it’s the uncomplicated nature of Destrier that also makes it such a charming film. Set in the winter to utilize the magic feeling of the location, Destrier focuses on the community and traditions around the fjord and the idea that old and new ways are being used in those rural areas as part of everyday life. 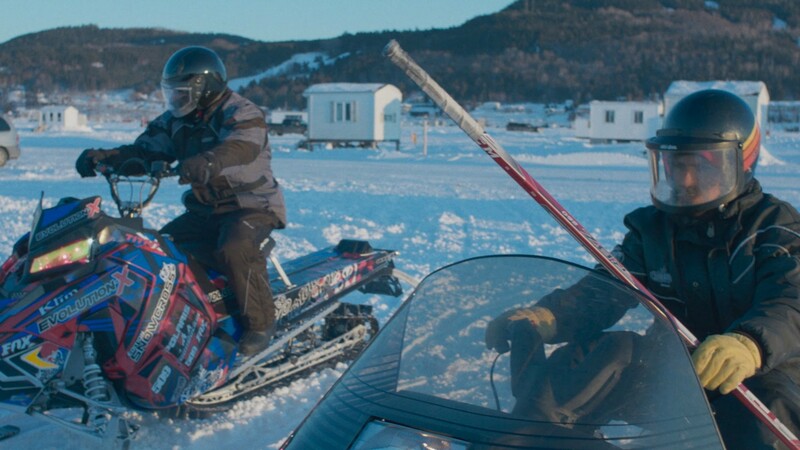 Growing up in the area surely helped Gagné in being easily inspired by the fishing shacks and snowmobiles found in the region and though the concept of two men jousting on snowmobiles with hockey sticks may seem ridiculous, it makes for an entertaining watch and is much more fun than your run-of-the-mill on-screen fist fight. A film short in dialogue, Destrier keeps its audience in the dark until after the halfway mark, making the reveal all the more appreciated and memorable. Once the cat is out of the bag, the comedy is heightened by the context up until the last moment and the actors sell the absurdity of the whole situation resulting in a succession of funny and ridiculous plot twists. 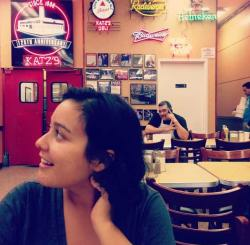 Technically, DP Alexandre Lampon should definitely take a lot of credit for the success of this short. Despite all the stunts and choreography the actors had to master, Lampon had his own routine to prepare as well. The choice of filming as a one-shot, perfect for the audience as it allows great pacing and quick and effective action, proved harder for the crew. Filming was a rather complex affair for Lampon, starting on foot, then seamlessly getting on a snowmobile and tied and untied from the rig, it took some well-considered choreography to ensure they captured the key moments from the best angles. The weather was definitely on their side that day, but with the natural light clock ticking, they were only able to capture three shots and none had Gagné completely satisfied. Evidently that was all they needed though and the editing process proved successful. I caught Destrier on its home turf at the Regard film festival and it instantly turned into one of my favorite shorts of their selection in 2017. Philippe David Gagné and his very frequent collaborator Jean-Marc E.Roy are in the post-production stage of a new short film FORÊT NOIRE, and he is also working on a few feature length scripts.